Most home barometers have a range from 29.00 inches of mercury (Hg) to 31.00 inches of Hg. If you happen to have a home barometer and take a look at it, you will notice it is nearly off the scale as the pressure level in the region today is mostly in the 30.75 to 31.00 inches of Hg range. That high pressure system origin source was in the Arctic so it is not surprising that it was yet another cold morning across the region. 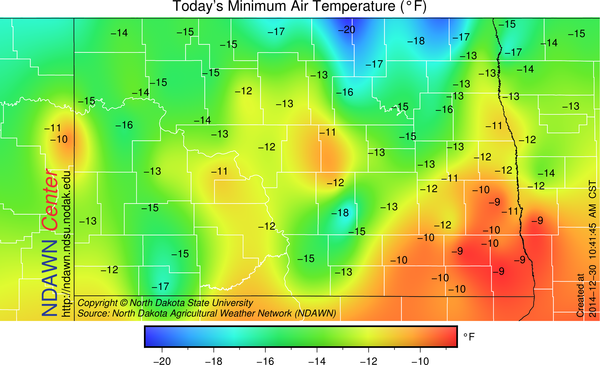 The North Dakota Agricultural Weather Network (NDAWN) stations recorded similar minimums to what occurred yesterday with the exception of western North Dakota where it was noticeably colder than it was yesterday morning as cloud covered helped keep the temperatures from falling to their potential in that area on Monday morning. That high pressure center is expected to continue to move southward into eastern Colorado by tomorrow morning. Because of the strong pressure gradient surrounding this very strong high, the wind will pick up later tonight into especially tomorrow from the west. On a positive note, a west wind brings maximum potential to our high temperature, but the negative is that maximum potential will generally only be in the 10s to around 20° and with the stronger wind, it will likely not feel anywhere near that warm. 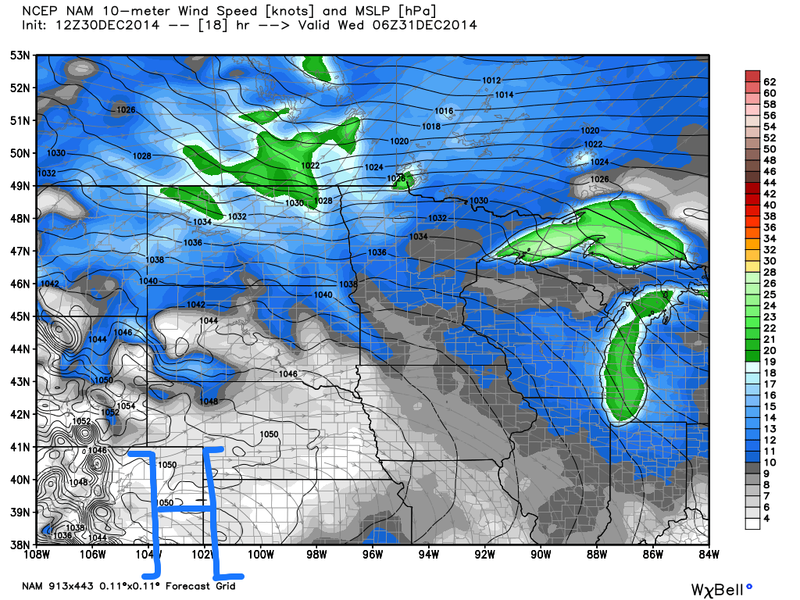 Surface Map and Wind Speed projection for midnight, Wednesday, January 31, 2014. Wind speed is expected in the 15-30 mph from the west tomorrow and more in the 10-20 mph later today into tonight. As that high pressure continues to move away from the plains, a weak upper air disturbance will form on the lee side of the Rocky Mountains in Canada and then move to the southeast. 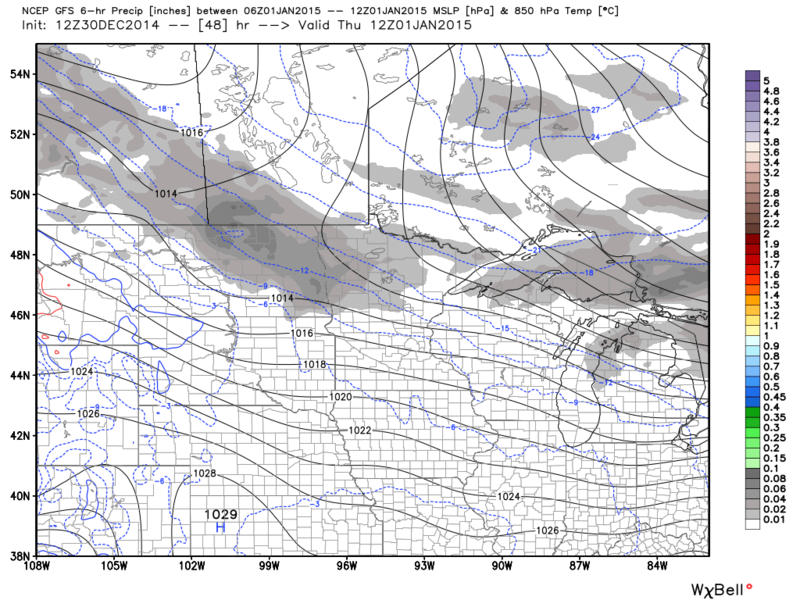 It should bring with it an period of light snow and / or flurries with minimum accumulations. The event looks to pass through quickly on New Year’s Day morning with much of the day dry, but quickly behind this fairly weak disturbance will come a stronger system on Saturday. This pattern appears to stay in place into next week. Each clipper will tend to have a narrow path of snow, meaning each event will strike any given location completely differently, but it will bring more abundant travel concerns to the area then what has been occurring in recent weeks.